The table-rappers are at it again. “We must touch hands,” says Quentin Collins to his latest lover, “and we must maintain contact throughout. Understand?” She understands; I think we all do. It’s another romantic, moon-stricken night, where we touch hands by candlelight, look deeply into one another’s eyes, and beseech people. Now, let’s take a moment to appreciate just how many problems he’s expecting to resolve between now and the opening titles. This isn’t a spot-fix for a specific issue; the man wants to resolve all of the problems for all of their lives — and this is a soap opera household, with industrial-grade problems. This could take all night. And there you go, consider yourself beseeched. They score a manifestation, who stands there in silhouette through the entirety of the theme song and then suddenly resolves herself into a dew, just when we thought we were getting somewhere. Quentin looks in the foyer, up the stairs, out the front door and basically everywhere in camera range, and the spirit of Joanna Mills is no longer among those present. She hung up as soon as we answered, another unknown caller that mankind wasn’t meant to know. We’ve been ghosted, by an actual ghost. “We’ve got to try and contact her again,” Quentin declares, but Daphne can take a hint. “Why didn’t she speak to us?” he asks. “She came, isn’t that enough? Doesn’t that tell us what we wanted to know?” It doesn’t, really. That resolves approximately three-tenths of a problem; we’re a long way from done. Naturally, they each have their own crackpot theory, which they communicate from a distance of zero inches. “Joanna will never be at peace as long as I’m here,” Daphne moans, which is funny coming from someone who just summoned Joanna from the grave literally two minutes ago. Daphne says, “Yes, I do think that,” which ought to throw some cold water onto Quentin, but it doesn’t. He just says “you’re wrong” again, and before you know it, they’re making out. And I don’t know, do I need to explain the metaphor here? The plot point shows up, and just when it could make a difference, it vanishes and here we are, making up excuses for it. And then suddenly we’re in Gerard’s bedroom, where Desmond is scrambling through the desk drawers and giving the place a good rummage. I don’t know if you recall, but as of a couple weeks ago, Desmond has been viewing Gerard with suspicion. He doesn’t really suspect him of anything in particular, it’s just nebulous background suspicion that this semi-permanent con-artist houseguest must be up to something. That was a super abrupt cut which does a little violence to the music cue, so apparently they’re trying to edit, which is adorable. There was a weird edit in the middle of the last sequence too — Quentin and Daphne were walking through the drawing room doors, and then teleported to a slightly different location. They managed to layer the soundtrack, playing Quentin’s next line over the pre-edit footage, before the characters snap into their new positions. But overall they’re not very good at editing, and at this point, I don’t think they ever will be. Desmond finds what he’s looking for — the journal of Judah Zachery, which I didn’t realize we even needed anymore — and then he stands there and reads the damn thing, to give Gerard enough time to come back from Roxbury and catch him with it. The boys snarl at each other — they’re two out of the three characters on the show who are currently in love with Daphne — and now they’ve both stolen the journal from each other, and they’re trying to work out which one of them is supposed to be offended. Desmond appears to be winning this contest, glaring at the interloper and saying things like, “We’ll see,” which is a bad sign. “Well, I wait with incredible anticipation for it,” says Gerard, which is marvelous. So I’m just going to go ahead and mint a new hashtag, and then back-date it over the last couple of weeks. That was Gerardspeak, and lucky me, there’s more to come. This is my favorite part of the show now, Gerard opening his mouth and things tumbling to the floor. “Thank you very much,” he replies, and the conversation just continues from there. He takes a walk around the desk. “I see you’ve been writing again,” he says. “People tell me that you’ve been working rather hard, up here all by yourself.” She’s in the drawing room, which is on the ground floor and there are people in and out of here all the time. This is what life is like, with Gerard around. And then suddenly we’re in Gerard’s bedroom, which works for me. They keep doing jump cuts to the boudoir. They manage to cover the break in the music cue with thunder sounds, which is fine, but I don’t know why they’re making all these random edits. It’s like driving a beat-up car on an unpaved road; we keep hitting bumps and little bits of the show fall off. “I know, Gerard,” scowls Trask, straight out of the blue. “You think Quentin Collins has become an obsession with me. But his continued defense of Barnabas incriminates him, too, in the death of Roxanne! 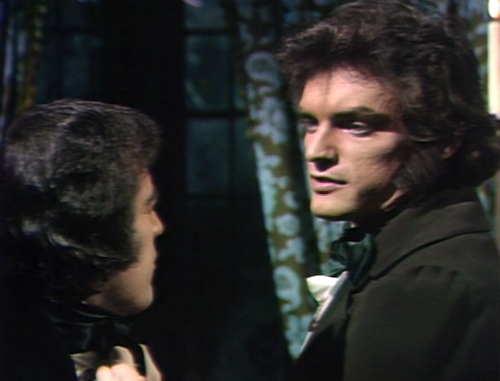 Barnabas and Quentin are involved in the ways of witchcraft, together! Together they do the work of their master, Lucifer! And together they will try to destroy us!” He could keep doing this all day, if you let him. This is what Trasks are like. 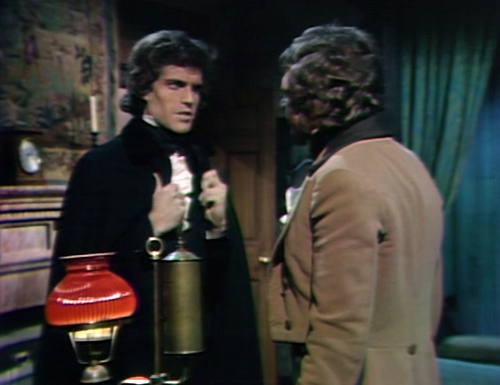 Trask thinks that Barnabas is responsible for Roxanne becoming a vampire, which he was, but not the way that Trask means it. 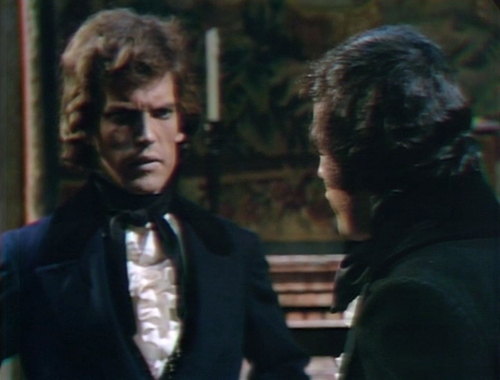 He thinks that Barnabas and Quentin built a lady vampire to destroy their enemies, including him. Gerard has the horrified expression of someone who’s trying to follow Trask’s line of thought. 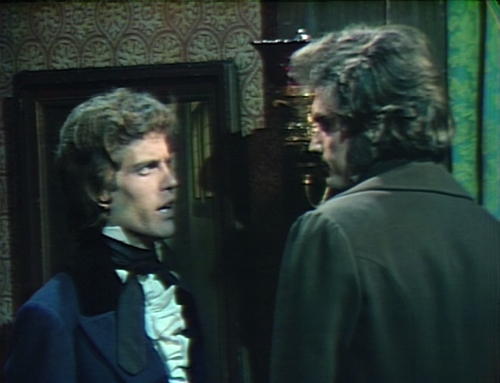 He points out that Barnabas was responsible for Roxanne’s destruction, which he was, but Trask says that’s because she got out of his control, and attacked his sister. I wish I could say that was unfair, but yeah, that sounds like a lot of things Barnabas actually does. And then suddenly we’re in the drawing room again, in the middle of an argument. It’s not a bad structure, actually, constantly cutting to another group of people who are even more anxious and hot-tempered than the last. 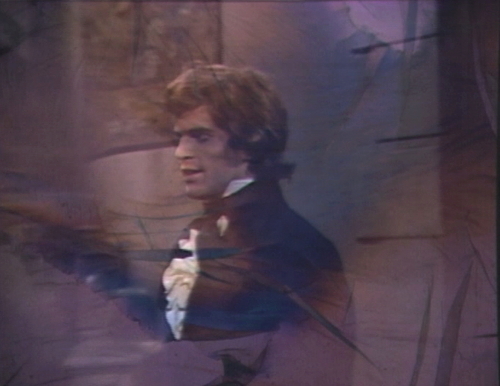 This is pretty action-packed for a late 1970 Dark Shadows episode, which tend to meander around the house looking for Hallie. Desmond is telling Quentin that Gerard is a dangerous, evil man, just like Trask was just telling Gerard that Quentin was a dangerous, evil man, and in a minute, Trask is going to walk in and tell Quentin that Quentin is a dangerous, evil man. There’s a lot of that going around. “Evil is a most corrupting agent, Mr. Collins,” says Trask as he stalks into a private conversation. “You know something,” Quentin rebuts, “I’ve often wondered what your fine rhetoric was all about. Now suppose you give me an answer.” I have no idea what that means. Then Quentin grabs Trask by the shirt and yells, “I said, give me an answer!” He must mean something by it, but I can’t imagine what. Everybody is super spikey today. Quentin shouts, “What are you talking about?” and Trask says, “I’m talking about the evil in your face, what do you think I’m talking about?” except that he doesn’t, he just hollers, “Soon, everyone shall know what I know!” and then he disengages and runs out the door. Neither of these people live here. “Why should I?” Gerard says, the very second that we come back from commercial. It’s another scene that starts abruptly, in the middle of a conversation. Suddenly we’re in Gerard’s bedroom again, this time with Quentin, and they’re standing really close to each other and yelling. This day is just getting better. They’re arguing about Desmond, I guess, not that it matters, something about the journal and Samantha and the letters. This is the most soap opera episode of this soap opera in a while, with everyone standing around accusing people of things and jumping to conclusions. There’s lots of references to things that aren’t explained today, like Joanna’s letters and Judah’s journal and Julia’s attack and The Call of the Wild Goose. You just have to try and keep up. Then Quentin sits down on Gerard’s bed and talks about his feelings, which is a definite step in the right direction, as far as I’m concerned. He’s only there for about thirty seconds and he spends the whole time talking about how he’s in love with Daphne, but shippers take whatever we can get. I can work with this. Quentin leaves, and then it’s just Gerard, on the other side of the fourth wall, muttering imprecations. This is another great soap opera name-drop, which they just lay on you and walk away. I’m not sure we knew that Judah wanted Miranda; we only saw them in the roles of witness and accused. But Miranda looked like Angelique, so I suppose just about everybody wanted her, back in the day. Hot blondes were pretty thin on the ground, in Danvers circa 1692. And then suddenly the lights are out and Gerard is chanting over candlelight, the one edit that they actually pull off successfully today. It’s a nice transition, which sets up my new favorite part of the show: another Markov-chain nonsense spell, courtesy of Gerard. “Daphne!” he breathes, holding up a little brass devil’s-mark. “Wherever you will be, you will fall into a very soft sleep!” We’re only thirteen words into this spell, and already I love it. “Do not fight me, Daphne!” he urges, as Daphne yawns and tries to read a book. “Surrender!” She keeps reading. She falls asleep, naturally, and dreams of Gerard. “Nothing is dangerous for you when you’re with me,” she says, so apparently it’s contagious. “Come to me whenever you want to see me,” he continues. “You come. You come.” So that’s something to look forward to, anyway. Tomorrow: The Truth of You. 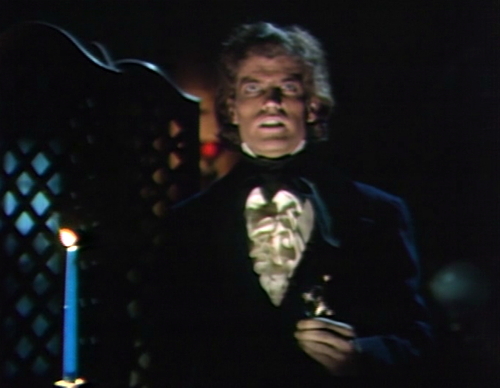 Join us for the Night of Dark Shadows post! 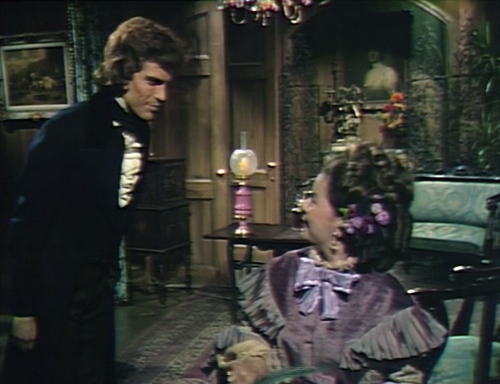 There’s still time to send in your comments for the Night of Dark Shadows post, by which I mean I still have to write two more episode posts, and who knows how long that will take, these days? We’re watching the 1971 feature film on the next pre-emption day, and everybody who hangs out in the comments section is invited to share your thoughts. Don’t write a whole review, just watch the film and jot down whatever occurs to you as it goes by. Send your thoughts to Dannyhornmail at gmail dot com, and I’ll fit them all together into one huge post. Then James Aubrey will tell me that I have to cut it down to two-thirds the size, and we’ll see how it goes from there. Comments friends: bring on the comments! Desmond tells Quentin that Gerard said he found the journal in his desk; Gerard actually said that he found it on a table in the hall. When Gerard asks Daphne, “Why are you always fighting me?” they cut to a camera that’s still zooming in for the next shot. I wonder if all those rough “jump cuts” are not edits, but rather multiple takes. Without a slating segment to kick off the episode, we have no idea how many takes were required to get through taping. Both Selby and Storm today seem well off their game. They probably had to stop and restart with taping multiple times, and when restarting the actors likely didn’t find their marks as precisely, which is why they seem all of a sudden to be in a different position – this would explain the mangled music cues. The music cues were being dropped in live from turntables in the control room as the episode was being taped. 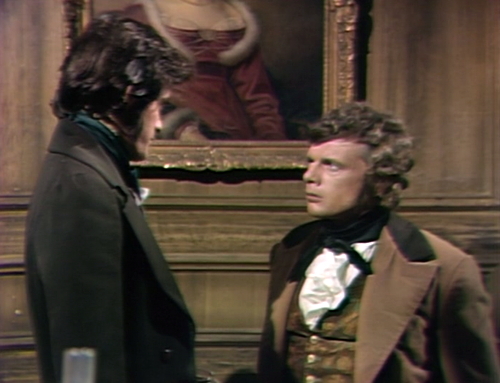 This episode was taped a mere seven days ahead of broadcast, so I doubt Dan Curtis & Co. would devote the time needed in an editing room fussing over all these minor edits. There are no end credits either, just the Dan Curtis Productions logo, which means the taping probably ran long with all the required takes and retakes. Recording wasn’t being done in the studio; the audio and video being captured was transmitted by telephone wire to another ABC building some blocks away where the tape machines were – which were also being shared by other programs, so they couldn’t afford to let a taping run too long. 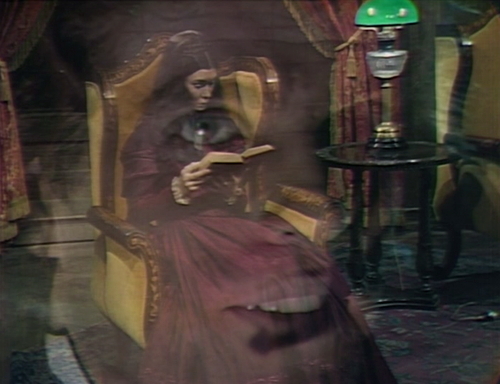 It occurs to me that not only is this the most soap opera-ish episode in a while, there is at least a vague connection with the haunting that Barnabas and Julie fell into in the first place. Kinda nice when that happens. Why is Lamar barging about, anyhow? I would think Quentin would just tell him to get lost; I mean, Lamar really doesn’t have any authority (like being a reverend) that entitles him. I know he’s part of Gerard’s (I mean Judah’s) EEEEEVIL plot, but that would only give him entry at Rose Cottage. 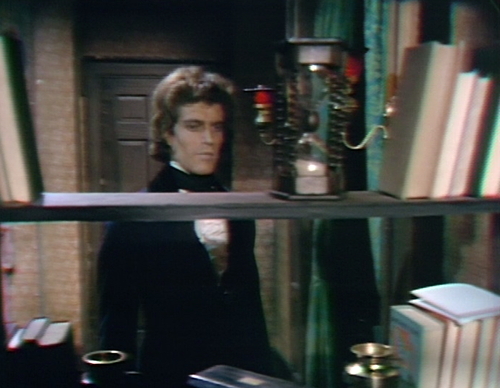 I’m still hoping Barnabas has another alcove available in the basement, but that probably won’t happen, will it? You know how guys always prefer the younger babes – Daphne is 22 and Miranda is like 222. Bet Angelique is up to 3 jars of Lancôme a day by 1840. Must be why Cassandra wears that phoney looking wig – by the 1960s she’s got no hair left? This storyline is not so great. I found myself wishing Trask’s version of events was the real storyline. The choking spell… with sympathetic magic, the tool which aids the magic is mostly for the benefit of the spell caster who needs to believe the tool is helpful. So it could really be any tool as long as it helped belief leading to the actualization of the will. The same can be said in terms of using a prop to move a story along. If we all could do magic like the people at Collinswood, the whole human world would end up in ruins in a year or two. Sort of the same as if we had all been able to buy SNL’s “Amazin’ Laser”. I spent a couple years doing a 90-mile, one-way commute which had me driving the god-awful DC beltway. I frequently imagined how a few Amazin’ Lasers could have improved such a drive, but of course, in a matter of days it would have gone all Mad Max and I’m pretty sure I’d have been one of the people vaporized in my car. The prop people might have been going for a primitive look for that piece, or maybe they blew the budget on The Mask of Baal. You have to give DS it’s due: there’s no ageism. Even a 200 year old has a chance. 3 jars of Lancome or not. Hokey smokes! I totally forgot about Judah possessing Gerard! A) Must Quentin always maul women as an expression of his affection? B) Lately when I see Gerard, I think he looks like some sort of Oompa-Loompa?